Hey, hey! 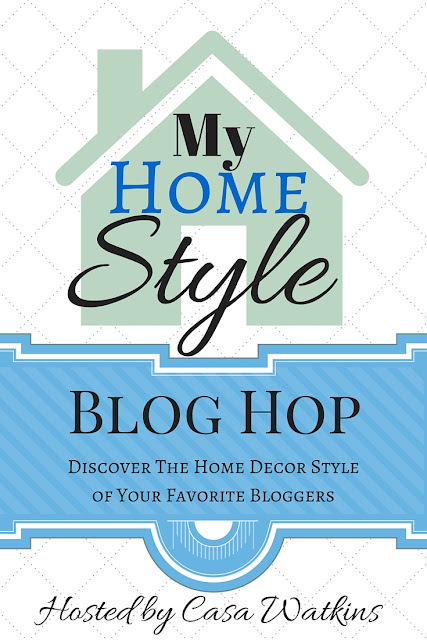 Today, I’m joining a group of bloggers for a big ol’ blog hop. What’s that, you say? Well, we’re each talking about our decorating style, which gives you a chance to discover other bloggers and their styles. When you finish here, simply hop on over to the next blog on the list at the bottom of this post. When you get to the end, go to the top of the list to catch the previous days’ lovely decor enthusiasts. If you’ve been around here awhile, you know my blog and my home style is “a doodle of this and a doodle of that.” Hmm, how to fit it into a category…. I love the casual coziness of French cottage style. Since moving into our new home, I also seem to be throwing a whimsical woodland vibe into the mix. And of course, my favorite color purple invades most of what I do. Sooo, woodland French cottage? All dressed in purple? Crazy? Yeah, that’s me! Building on wooded property has prompted me to incorporate more nature-inspired décor into our home. From the bird light fixture in my kitchen to the bird stencil in my laundry room, things are getting a bit tweet-y around here. I plan to take advantage of all the wild grapevine, moss, rocks and wood on the property for projects and vignettes. Woo-hoo, free supplies! I love French style furniture, but nothing too fussy or formal. I haven’t yet shown the master bathroom in my new home tour, but this curvy legged table that once sat in our foyer now serves as my vanity table. The chair was a thrift store find that I rehabbed with paint and stenciled drop cloth fabric. I have always stood at the sink to put on my makeup, so this is real luxury. Or laziness…? The hewn stone look of our fireplace and the curvy corbels of the mantel help create the cottage look- just enough rustic vibe to keep it from feeling formal. Did you see a bit of purple peeking through many of the pictures? You’ll find touches of purple throughout our home, though I TRY not to go toooo overboard in deference to my husband. Richard is actually somewhat color blind, though, so colors don’t really matter much to him. I’m so blessed. Your writing style is so entertaining to read Sheila! Your home style is very pretty and romantic. I love that it doesn’t feel too formal but has some great nature and rustic touches. Gorgeous fireplace/ mantel. Sheila I love your cottage woodland decor style. It is so whimsical and inviting! Love the purple too, its my favorite color. Pinned and shared. This is so fun and such a unique and different take! I love the Woodland stuff especially and well as that vanity. Very beautiful and I am glad to have found you. Thanks for sharing! Your home is so pretty! I love that mantel and I say if you love purple, put it everywhere! I enjoyed seeing your style and meeting you during the blog hop, Sheila! I love the lavender throughout your home and am about to add some to mine. It’s such a pretty color! Sheila, your home feels so serene! You have a beautiful home and style, I love how chic and calm everything feels. So pretty! Love the tour. Thank you for sharing! And that light with the iron bird is so unique!! I’m a bird gal, too. Your home is so pretty, Sheila! Love, love, love all of the woodland touches you include! Sheila, you have such a beautiful home! I’ve always hoped to find land with plenty of trees to build on, but around here that’s pretty hard. I can pray one day though, that I have luck and do find a lot to build my dream home on. I can imagine it does help influence your decorating, and like you I hope to honor that. Thank you for sharing! What a fun tour, Sheila! I love your new home and style! You know I could just sneak the bird chandelier out when I come visit- love it! You home is light filled and so serene. The rustic flair is perfect for your wooden land and the touches of purple are wonderful. Thanks for sharing the tour win us!